are never going to listen." "It's not so easy, this piano playing..."
Staggering coincidences still stagger without the need to imbue them with silly notions of fate and weakly reasoned 'it-was-meant-to-be' codswallop. But this one's a doozy. I caught Stephen Fry On Wagner on BBC 4 last year (the original one hour version) and was captivated by one extraordinary scene. 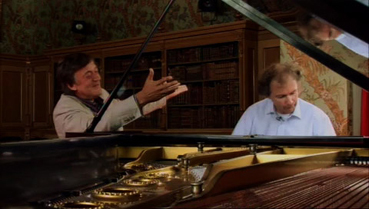 Well over 50 now, Stephen Fry was in a childlike rapture with a virtuoso pianist, Stefan Mickisch, effortlessly recreating some hugely emotional pieces from Wagner's Tristan and Isolde. It was that delight in genius, an elation that a mere human being could conjure up such profound emotion in others even if the experience is fleeting and for most of us, unfathomable. Fry's reactions in this superbly cut scene are honest and so in the moment, it almost feels like voyeurism to enjoy it. But haven't we all fallen prey to great art like that? Haven't we all enjoyed something on an almost spiritual level, an intense frisson that informs even staunch atheists like myself that there is something beyond human reason and the indifference and harsh vicissitudes of daily life? I just had to watch that scene again and I'm just still astonished by how moving it is. I'm going to admit that I just watched it even one more time. Stunning. I'm getting ahead of myself. I've played that scene over and over and it still has power (helped significantly by the skill of the pianist and Wagner's jaw dropping talent). So I was moved to write a letter of appreciation to the editor in particular, Amanda Young, as I sometimes am moved to do when touched by something that goes beyond my usual reaction to the bulk of easily disposable TV. Not only are there inherent editorial problems in cutting any scene, this one featured a musical performance and as any editor knows, to maintain the integrity of the piece being performed and cut it down to a manageable length is not an easy feat. Fry's reactions were real and they had to be cut to certain pieces of the music. Timing is all and this sequence played as if it were a self contained scene and gave the magical impression that it hadn't been cut at all. I'm all too aware of how much work that takes. I like industry people to know when they've performed magic because, the gods know, appreciation doesn't exactly flow in the TV/Film industry (although to be fair, director McGrady is full of praise for his editor's contribution). Counter-productively low budgets and lack of time are now pitiful constraints upon creativity and any diamond that shines needs to be supported. The letter writing was relegated way down my 'to do' list because of a particularly busy period and to my frustration in hindsight, it never got written. Six months later, I started work on a TV series for ITV and my co-editor (to my stunned shock) turned out to be the one who actually cut that programme. How likely was that? This in turn led me to finding out that an extended feature length version of the film is doing the festival rounds and will be out on DVD on February 21st. Enter DVD Outsider... Regular visitors will know that I am a fan of Stephen Fry. It seems as if he stands regrettably alone in the UK as the acceptable face of intellectualism in a global society beset by a rapidly surfacing undercurrent of irrational hatred or at least disrespect of 'cleverness'. Yes, he can inflame by one or two mis-posted tweets but his enormous heart and considerable mind are in the right place (or, as he says of Wagner in his final scene of the film, he is "on the side of the angels..."). His championing of a young HIV sufferer in a previous documentary moved me deeply and his light but terrifically entertaining series on the US (Stephen Fry in America, reviewed here) did a lot to convince the discerning and undiscerning viewer that the casual British disdain of perceived aspects of the collective American character is not only wrong, it's deeply and unhelpfully divisive. Well, here Mr. Fry takes on something a lot more morally ambiguous born from a deep love of the work of the most controversial composers in the musical world (and one of its true giants), Richard Wagner. After years of planning what must have been a labyrinthine and tortuous approval process, director Patrick McGrady and his team took a very fortunate Fry behind the scenes of the annual Bayreuth (pronounced 'By-Royt') Festival, the Wagnerian Mecca. Think in film terms of a custom built cinema designed by Stanley Kubrick to screen his movies exclusively, in pristine form once a year. The real DNA of the story that takes this documentary into difficult areas is a certain Adolf Hitler and his role in appropriating Wagner, his ancestors and his work for his own vile, Nazi ends. Fry discovered a few years ago on the sometimes-excellent TV series Who Do You Think You Are that a great many of his Jewish ancestors were executed in Auschwitz. But to this film's and Fry's credit, they tackle the subject head on. A close friend of mine discovered that her favourite author did not share her own political leanings and she stopped reading the author's work out of principle... This bemused me. It's not as if the work had less merit or if the author was actively promoting a political agenda within her work. If the writer had been doing this, she wouldn't have been my friend's favourite author, QED. But Hitler is a bigger obstacle to get past and in Fry's case, for intensely personal reasons. How he faces up to this dilemma unfolds in a fascinating slow burn as we make our way through the wonders and woeful history of Wagner World. Director McGrady's coverage and choices are classical in film craft terms, full of rock solid symmetry in framing and on the whole tripod based. I don't usually need to mention the three sticks that keep the camera at our eye level imparting the grace of stillness because it used to be the natural order of things. Nowadays, documentary filmmakers seem to have inherited the tics and amateur-like shouldered camera 'hipness' and so called 'reality' that bedevils a lot of sub-par film and TV but McGrady has stayed well clear of this inappropriate nonsense with a few notably well crafted hand held exceptions. The direction is clear, uncluttered and lets Fry set the agenda in his dealings with the many fascinating characters he comes into contact with. The style also echoes the preciseness of its subject (the grand old German not the urbane English enthusiast). Amanda, the editor, informs me that the film also rewards Wagner enthusiasts with visual puns a-plenty. Alas, they passed me by. My knowledge of the great man's work is limited to Robert Duvall, helicopters and dying Vietnamese. Interesting that Wagner's work seems to inspire military leaders to wreak havoc on humanity. In short Wagner & Me presents its contentious subject with no judgement save Fry's tortured emotional reactions and retains an almost Brechtian invitation to make up your own mind on where you stand with these breathtaking works of musical drama. Which is exactly as it should be. Apart from the aforementioned scene, there are many nuggets to enjoy. First of all, Stephen Fry seems to be in a continual state of awed reverence and, dare I say it, glee. This sustained rapture reminded me of a recent trip I made touring the 20th Century Fox lot with an insider, an old friend who was working on Joss Whedon's Dollhouse. I could not have been happier. For the film's 89 minute running time, not once does Fry or the film-makers give the impression that there were second takes, so effortless is his enthusiasm communicated. I know how easy genuine passion is to communicate (I do this as a very small part of teaching students film-making) but to get it captured like this - unencumbered by the difficult process of actually shooting it - is a real treat. Each interview subject housed in their own surroundings has something very specific to offer on either the Nazi stain or the beauty and relevance of the music. Seeing Fry refuse to climb up to the podium where Hitler lauded over all at the Nuremberg rallies after a resounding and informative chat with Dr. Joachim Köhler, author of Wagner's Hitler, you feel the actual dilemma in Fry and I suspect in all of us, a dilemma that has become as concrete as the podium itself. I've not seen such specific ambivalence captured in a documentary before. If you wanted to snipe, you might feel that seeing Fry at the podium would have been simple bad taste. Why stand in the shoes of such a man, a man capable of reaching into the future to disgust anew at every thought of him and his rampant and genocidal anti-Semitism? Personally I think Fry made the right decision for the right reasons. At Outsider, we like our coverage comprehensive but the preview disc contained no Extras. I spoke to director Patrick McGrady about the actual release. I was curious about two aspects of this remarkable film – the Extras and how on Earth a BBC 4 one hour suddenly finds itself touring the world as a documentary feature. The Extras – over half an hour – feature deleted scenes, a full orchestral performance of a scene shortened in the movie itself and one other deleted scene that I'd be very curious to see. 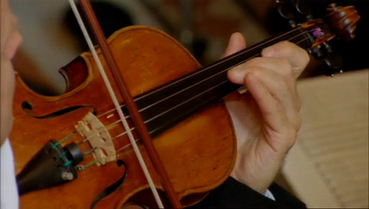 The word 'leitmotif' may or may not stir some dormant memories from a long distant music lesson. It's the key word that means a recurrent theme alluding to a character or location – Wagner invented drama's 'personal theme' – an extraordinary fact to truly grasp. So when you hear John Williams' 'Dun-dun, dun-dun, dun-dun...' ode to a big fish, remember it's a German musical dramatist born in 1813 that gave us this precise dramatic idiom. 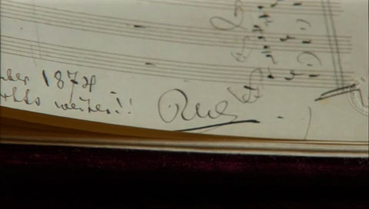 I would be very enthusiastic to see more of Fry's interaction with virtuoso, Stefan Mickisch as they explore Wagner's use and creation of the 'leitmotif'. For this Extra alone, I'm keen to buy the finished DVD release. During the production of the film, director McGrady realized that the subject matter and presentation would warrant a longer cut and further an ambition to reach a wider international audience. Sheer bloody-mindedness (an essential trait in any film-maker's arsenal) took the project into feature length territory and that decision has been rewarded. The film has won international acclaim and is playing in New Zealand as I write and will soon be playing in Australian theatres. Fear not, UK Wagner/Fry enthusiasts. On the 21st of this month, this remarkable documentary is released on DVD. For more information on the film and where it may be showing theatrically on a screen near you (on the global stage), check out its web site www.wagnerandme.com. You'll find a Facebook link there on the front page too. The HD Video (one assumes) looks terrific and the Dolby Digital mix is crystal clear which is a definite plus when dealing with the subtleties of recorded music – eliciting emotion being the key here. The recordings are crisp and the music pleasingly surrounds you – not too much for the sub woofer to get a hold of but that's hardly a complaint. And Bayreuth looks gorgeous – the colour palette is particularly noteworthy and not just Fry's yellow and red ensemble in one scene. This is where David Attenborough's dress sense logic comes into play. If you notice, the great man's filming clothing is always unfussy and muted – because the audience's attention should not be drawn away from the actual subject of the documentary itself. Due to Fry's red trousers and yellow top in a scene introducing Wagner's patron, you almost lose sight of that extraordinary palace in the background, so shocked are you by Fry's sudden lurch to a sartorial 'Refreshers-inspired' colour palette. But then, you are dealing with a man who turned up in a tie at a TED talk simply because the rule was you didn't wear one. Our leading British, self-styled cultural ambassador takes us through murky and personal dilemmas in his ongoing appreciation of a musical genius. This is enrollment filmmaking at the top of its game. Find a truly passionate presenter, give him an all access pass to the subject of his passion and let him guide you to a level of appreciation that any weighty tome could never match. Make me care, Stephen and he does in partnership with terrific and unfussy filmmaking. What's not to love? For that one superb piano scene alone, this DVD comes highly recommended.